A birth is typically thought of as an event full of joy; the culmination of months of many different hormonally influenced emotions – excitement, apprehension, joy, sadness. It’s the act of closing one door and opening another, moving from being pregnant to being a parent. Sometimes though, birth doesn’t happen the way you expect, or your feelings of joy at becoming parents quickly turn to fear when you or your child has complications. I had been mentally preparing to have a natural birth, but as soon as I began having complications halfway through the pregnancy, I knew that the plan might not end up working. I was referred to the perinatal specialist at 20 weeks for early cervical thinning. At 23 weeks, I was admitted to the hospital on bed rest, with a pessary inserted, because my cervix had continued to thin and was beginning to dilate. I would say that was probably the beginning of my birth story. We lived far enough away from this hospital that I needed to be admitted, so I was feet away from their Level IV Neonatal Intensive Care Unit (NICU), in the event that I went into labor. Over the next five weeks, I hung out in my bed, crossing off the days I kept my babies “cooking.” As we approached week 5 of bedrest (almost week 28 of pregnancy), my doctors began to talk to me about the possibility of going home, albeit still on bed rest. We decided that I’d go home over the weekend, so my husband would be home for a few days to help get me settled. That Saturday afternoon, I began feeling some tightening in my abdomen. At first, I wasn’t sure it was anything (this was my first pregnancy and I had not had any contractions yet), but as they continued, I knew something was happening. 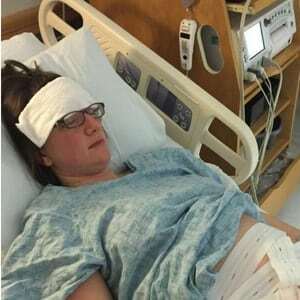 My team wasn’t too worried initially since contractions can be common during twin pregnancies. As the contractions continued and became stronger and more frequent early Saturday evening, it was decided that it was time for me to move to Labor and Delivery for more monitoring. After a short trip down the hall to L&D, it was time to make the game plan. I wasn’t yet at 28 weeks, so our twins still needed extra time to develop, and I had not had steroid shots since I was admitted over a month prior. Since my contractions weren’t letting up, I was started on magnesium sulfate to try to stop my contractions and started another round of steroids to help the babies’ lung development. Ideally, the steroids are given about 48 hours before delivery to give the greatest benefit. Thankfully, by Sunday afternoon, my contractions had stopped, so I transferred back to my room. The idea of going home was off the table now, but we were at peace with that since we knew delivery could be happening sooner than later. By Monday afternoon, I had started having contractions again. 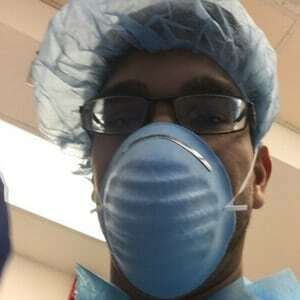 When they had continued with increasing frequency and intensity by late evening, it was time to get checked and head back to labor and delivery. Since the twins were so little, there were so many emotions going through our heads: apprehension, excitement, worry. One of the obstetrics residents came by to check and see if I was dilated, even though my pessary was still in place. When she checked me, she looked up at me with a concerned look on her face and said that a very tiny hand had just grabbed her finger (let’s just say this resident had yet to master her “keep calm and fake it” face, which was not reassuring.) 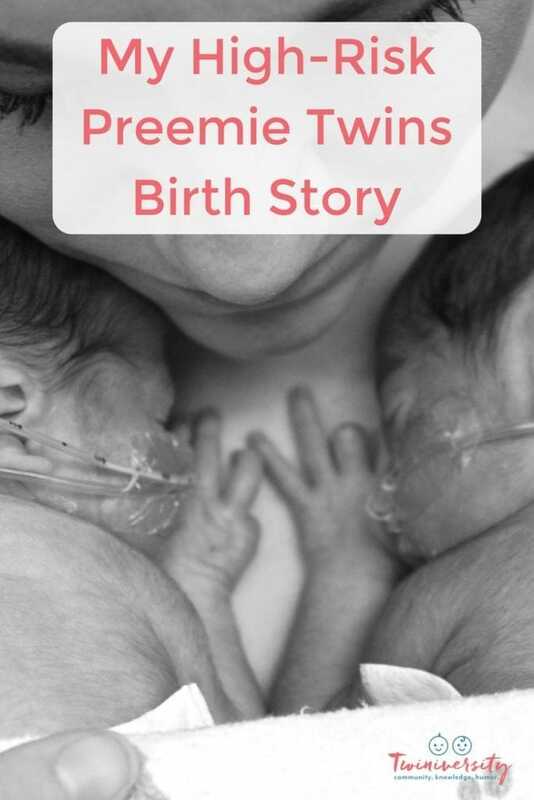 My apprehension had started to ratchet up to some real fear that my twins may be delivered by residents who seemed to know nothing about preemies. After this check, I was moved over to Labor and Delivery, where I thankfully began to see some familiar faces. My perinatology fellow was the next one to check me and took out my pessary. Grateful to her, she exuded confidence, even when she explained that there was a little foot sticking out of my cervix. Once my attending walked in, I felt a huge sense of relief, knowing that we all were in great hands. Shortly after this check, my water broke, so we all knew there was definitely no stopping this train now. 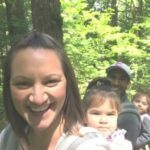 Since Baby A was moving all over, she and our attending physician explained that it would not be safe to do a vaginal birth, so it was time to prep for my c-section. The anesthesiologists came to explain the procedures (no one warns you how hard it is to focus when you’re having contractions!) and to tell my husband that if they couldn’t get me numb with the spinal, then I would have to go under general anesthesia and he would not be allowed in the operating room. As we got ready to leave, the L&D nurse brought my husband his OR gear, told him to get dressed, and said that my prep shouldn’t take more than 10 minutes, she’d be back for him then. The team brought me into the operating room, where all of the surgery prep took place, while we all chatted. No one was really in a hurry since this wasn’t an emergency situation. After I was numbed, prepped, and hooked up to the monitors, my husband was allowed into the OR. The poor guy thought something was wrong because it took them longer to prep me than they said it would. Someone probably should have just overestimated the time it took, to save him from his first-time dad worries! 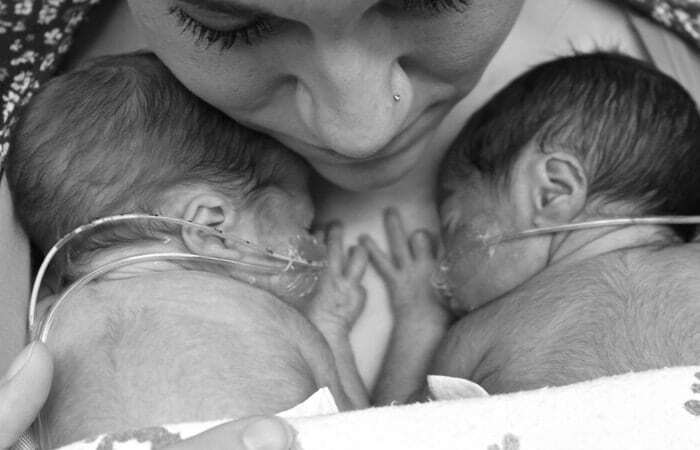 As they were closing me up, the girls had stabilized enough to be transferred to the NICU. I was able to see them very briefly as they wheeled their isolettes past me. The nurses lifted them slightly so that I could see them as well as possible, then got on their way. Parents aren’t allowed in the NICU during this stabilization time, so my husband came back to me and was able to show me the pictures he took. I was moved to the recovery room, where I tried to get some rest, while he filled the family in on our new additions. Once I was ready, I moved back to my original room, where I immediately started pumping breastmilk because I had really wanted to breastfeed. I had lost a lot of blood, so I was really tired, but my nurses were really good at helping me stay on pain medication. After a while, my husband was able to go back to the NICU to the see the girls again. Several hours later, I was recovered enough to be wheeled to see and finally touch them, as well. I was discharged after a few days and stayed at the Ronald McDonald House near our hospital, while the girls spent the next 80 days in the NICU. After those 80 days, we took them home, to finally experience parenthood on our own. 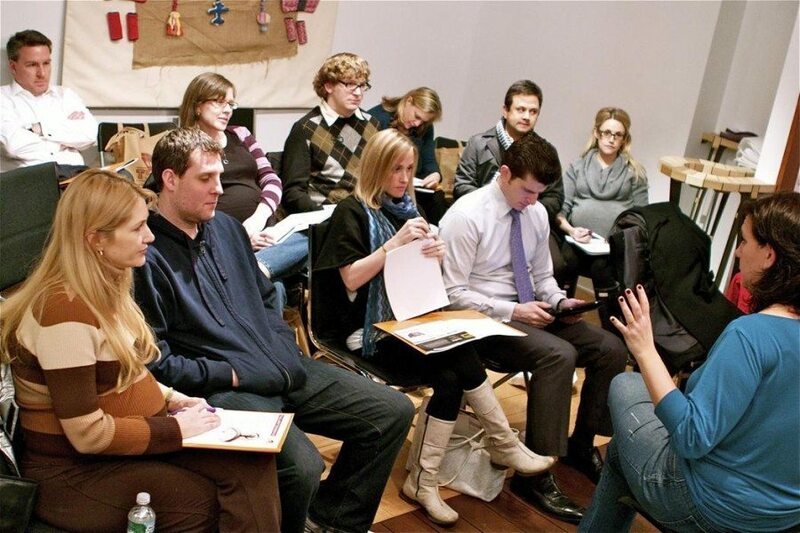 Build a rapport with your team. Your doctors and nurses are there to help you and your babies stay healthy. Talk with them, do your own research, and ask questions. If you feel uncomfortable having a real conversation with your doctors look for somewhere that makes you feel comfortable and confident in their knowledge and decisions. Remember this isn’t your fault. I made all the healthy choices I could, but in the end, I still ended up delivering preemies. Rather than dwelling on what went differently than I planned on, I asked myself, “What can I do?” and did everything I could to stay relaxed on bedrest, educate, and prepare myself for delivering preemies. “Just keep swimming.” If you’re in this situation, there isn’t always much you can change about it. Yes, having a high-risk delivery is incredibly stressful and challenging, but it will make it much easier on you to be able to find the positives/silver linings/humor in every moment, no matter how small. Heather Patel lives in the Finger Lakes of New York with her husband, 2.5-year-old identical twin girls, and their rescued lab mix. A former special education teacher, she is enjoying her new role as a stay-at-home mom. So far, her first experience as a mother has included surviving hospital bedrest, delivering 28 weekers who had a nearly 3 month NICU stay and raising twins with developmental delays. She also looks forward to passing on her love for the outdoors, photography, and DIY to her girls.